Consists of: 1 starter and add-on units to desired lenght. (Ex. 20' run consists of 1 - 4' starter & 4 - 4' long add-on wall sections. Units do not include shelves. 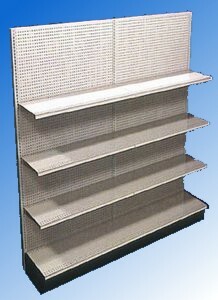 Please order your shelves after you add your sections to the shopping cart. Ordering Instructions: Order one starter section for each row. Order add on sections to desired row length. Please note that rows will be 2" longer than nominal length. For example: an 8' row will be 8' 2" overall length. Slotwall backs have a longer lead time.